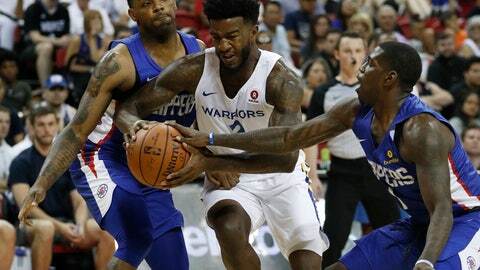 OAKLAND, Calif. (AP) — First, his right forearm cramped turning his arm into the shape of a V as his hand bent back, and Jordan Bell could not move it for several minutes as he sat in the bathtub as he recovered post-workout. He yelled for his girlfriend’s help. The cramp briefly released, then quickly returned. Soon, his quads, calves, hamstrings, biceps, hands and feet followed suit. Then, Bell blacked out. He came to and his girlfriend got him into bed, and he doesn’t remember anything but waking up there. It was terrifying — “very,” Bell said. He realized he had pushed his body to the brink of physical exhaustion after one especially grueling mid-August day with far from enough food and fuel. He did his cycle class, weights and conditioning, then a couple hours of open gym in Los Angeles — his regular routine all summer to get ready for his second season with NBA champion Golden State. He’s feeling great now with training camp set to begin Tuesday. Just chalk that scary experience up to another key learning moment in Bell’s evolution to rising star with the Warriors alongside All-Stars Kevin Durant, Stephen Curry, Draymond Green, Klay Thompson and, now, dominant big man DeMarcus Cousins. Bell’s dynamic play in the post will be even more important now with three centers from last season departed — Zaza Pachulia signed with Detroit, JaVale McGee joined the rival Lakers and David West retired — and Cousins is still recovering from a torn left Achilles tendon that required surgery and ended his season in late January. And Bell spent the summer taking his fitness and game to another level. He often forgot to eat, just wanting to get home and into bed. Then he learned his lesson with the blackout episode, likely dehydrated, too — another in many key growth opportunities for the Warriors’ second-round draft pick out of Oregon last year. In Golden State’s fourth game, he threw the ball off the backboard to himself and slammed it home for his own alley-oop. In a blowout win no less. Rookie mistake? Maybe. Growth moment? For sure. Even if Curry and Durant could only watch in awe and delight, their mouths agape. Bell tossed the ball off the glass then dunked during a 133-103 victory at Dallas last Oct. 23. Coach Steve Kerr spoke to Bell afterward and warned him he might face some retaliation the next time against the Mavericks. Now, Bell is ready to take on a greater role as the Warriors chase another championship as the NBA’s team to beat out West. He’s also treating himself to a new smartphone at long last this season, his other one cracked on draft day a year ago. Though the old one will find a special place in his trophy case. Bell’s troublesome ankles are strong and healthy, too. He was out with a sprained left ankle for 14 games from Jan. 20 through Feb. 24 before working his way back into Kerr’s deep rotation while continuing to deal with ankle issues. After being inactive for six games early, he had emerged as a starter for 11 games before the injury as Kerr went with a more up-tempo lineup. It took time for Bell to find his groove again. He wound up averaging 4.6 points, 3.6 rebounds and 1.8 assists while playing 14.2 minutes in 57 games with 13 starts. Kerr realized early on he needed to create ways to get Bell minutes. While the rookie needed to learn, he would do so by making mistakes and strides on the court next to so many greats. Then Bell impressed everybody as he handled the load of helping defend James Harden. Bell earned key minutes as the Warriors went on to a repeat championship and the franchise’s third title in four years that sent Golden State into dynasty status.